Trumps recent trip to Europe and the dust he has raised there has resulted in many news articles and proclamations being issued regarding NATO. There are some indications that is all much ado about nothing and that when the dust settles, nothing will be different. Other indications are that we may be seeing a fundamental shift in the force and alliance structure that will at least transform NATO as we know it. Trump cannot be predicted. His rhetoric weaves to and fro the way a drunk walks down the street. It is difficult to know where he will end up and if he even knows where he is going. Perhaps that is the nature of the times, or perhaps that is the nature of his own personality. Perhaps a combination. Whatever the causes, a cloud on uncertainty seems to have appeared on the horizon. So, I am starting this thread to track the development of that cloud. Perhaps it will simply dissolve away, in which case the thread can safely make its way to the back pages. Or perhaps the headlines will continue to be forthcoming regarding this topic, in which case this thread might have a long life with many views and posts. Part of that depends on you readers. So, I do hope many offer your opinions and perspectives, even if I don't particularly agree with some of those perspectives. 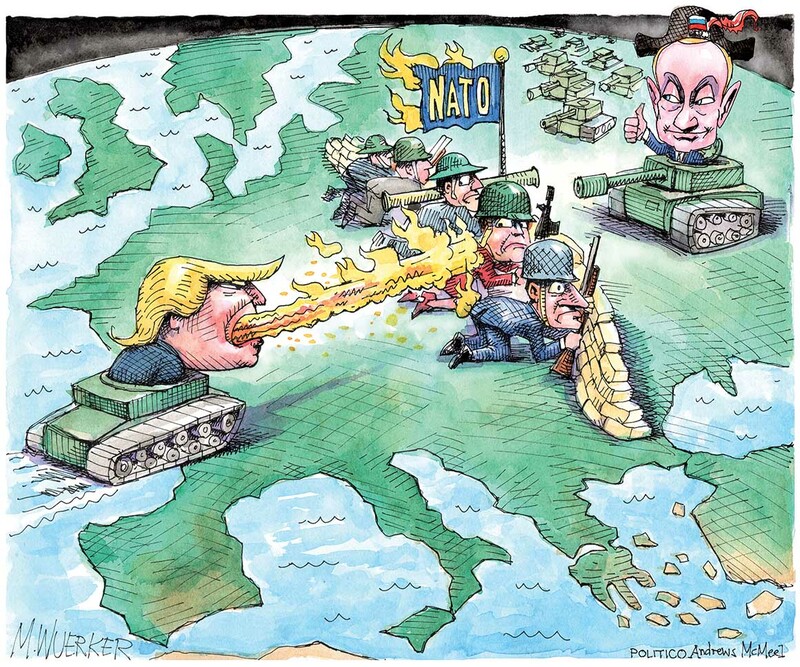 (Counterpunch) The summit meeting of the North Atlantic Treaty Organization, the military alliance that is expanding its deployments of troops, combat and surveillance aircraft and missile ships around Russia’s borders, took place on July 11-12 and was a farce, with Trump behaving in his usual way, insulting individuals and nations with characteristic vulgarity. He is absolutely right about that, because the US-NATO military interventions in Iraq, Afghanistan and Libya have been catastrophic. It is intriguing that NATO’s secretary general can at last admit that military muscle doesn’t solve every problem, but he did not expand on the subject of Libya, which unhappy country was destroyed by US-NATO military intervention in 2011, and it is interesting to reflect on that particular NATO debacle, because it led directly to expansion of the Islamic State terrorist group, a prolonged civil war, a vast number of deaths, and hideous suffering by desperate refugees trying to flee from Libya across the Mediterranean. The leaders of Europe are also thick-skinned, lifelong politicians who know how the "game" is played, and none of them will be so rash as to leave NATO or support its fundamental alteration because of Trump's meaningless hot air. They're all aware of the fact that he could be gone in as little as 2 1/2 years. Your early statement that Trump's tumultuous visit to NATO "is all much ado about nothing and that when the dust settles, nothing will be different" is almost certain to be the case. Trump is right about one thing: NATO's member states should be spending more money on their militaries. His 4% of GDP demand was silly and dead on arrival, but 2% is doable. Also, before we speak about a "fundamental shift in the force and alliance structure that will at least transform NATO as we know it," let's remember what NATO's fundamental purpose still is: to prevent Russian from taking over Europe. Thanks to underfunding of their militaries, NATO's European members are collectively failing to uphold the basic premise of the alliance. So instead of thinking about how NATO can be fundamentally shifted or transformed, let's first make sure it has "mastered the basics" and is capable of repelling an all-out Russian attack. Getting everyone's defense spending up to 2% of GDP would go a long way to accomplishing this. Getting the poorer, ex-Communist members to finally rid themselves of Cold War weapons like AK-47s and MiG fighter planes and to upgrade to Western weapons should also be an important objective, as it would harmonize logistics and military training regimens across the alliance and save money in the long run. let's remember what NATO's fundamental purpose still is: to prevent Russian from taking over Europe. Thanks to underfunding of their militaries, NATO's European members are collectively failing to uphold the basic premise of the alliance. This underfunding is taking place exactly because European elites are well avare of real likelihood of this "Russian invasion". USA is another story, they are the slowly declining empire obsessed with maintaining of their eroding hegemony. Of course they are angered by the fact that "allies" (in fact vassals) are not willing to share the "common burden". With a thanks to Sciencerocks for finding this on the internet. NATO was formed as a military alliance to block the Soviet Union from expanding its power. It is a product of the time it was founded. That was a time when the Soviet Union was a superpower that penetrated deep into Europe and Central Asia. But that time doesn’t exist anymore. Russia is now smaller and much weaker. The common goal that kept the organization held together has withered away. The disintegration of NATO was predicted, and has been well under way, long before Trump had his personal grievances with European leaders. In geopolitics, there are no permanent allies, only permanent interests. NATO has lost its purpose. But the US still wants to block Russia --- just at minimal cost. Germany is now far away from Russia and won’t be of much help. The US would need to form a military alliance of countries closer to the frontlines, along Russia’s frontier. Has the US been doing this? And if so, what countries are part of this? The US would need to form a military alliance of countries closer to the frontlines, along Russia’s frontier. Has the US been doing this? And if so, what countries are part of this? It wouldn't make much sense to start a new alliance really, considering almost everyone they would need are already members of NATO. I guess to fully meet Russia's borders they would need to add Finland, Belarus, Ukraine, Azerbaijan and Georgia, which are all theoretically neutral but Russia is pretty well contained from any western expansion beyond these nations. (Al Jazeera) Georgia has only one highway. It cuts through the country horizontally in the middle, connecting its east to the west. Any hostile act on E60 would pose an existential threat to the whole nation, disrupting its food supply route. And Georgians are well aware of the potential consequences of such a scenario. It's exactly what happened just 10 years ago. 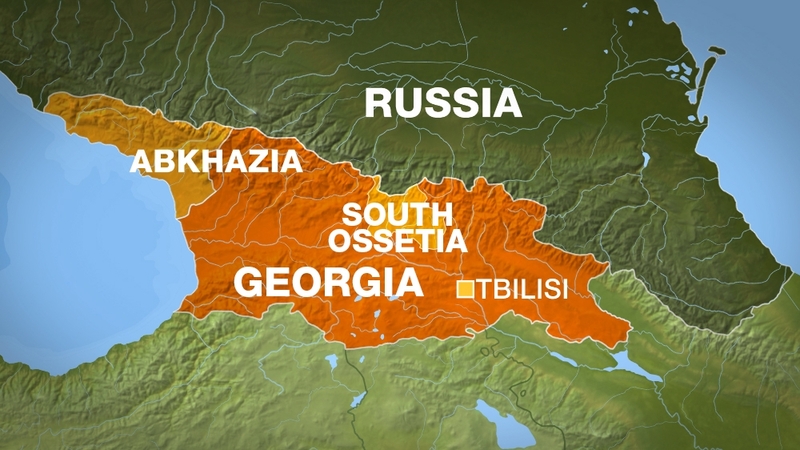 The five-day war that broke out overnight on August 7 in 2008 between Georgia and Russia saw Russian tanks rumble through South Ossetia - a breakaway region since 1991, enter Georgia proper and camp on E60 just outside the capital, Tbilisi. The move not only humiliated the Western-minded small nation, but temporarily broke the country in half, revealing the consequences of an attempt to move away from the Russian sphere of influence. Although not mentioned in the introduction, the subject of NATO is discussed later in the article. NATO foreshadowed its unreadiness to take in states with territorial or border disputes in 1995 in its study on the how and why of enlargement. That study called on potential aspirants for membership to resolve those disputes before joining—precisely because the alliance did not want to import Article 5 cases into NATO ranks. NATO won't admit Georgia so long as Russia occupies two enclaves of its territory. (Counterpunch) The US military practice of placing nuclear weapons in five other countries (no other nuclear power does this) is a legal and political embarrassment for US diplomacy. That’s why all the governments involved refuse to “confirm or deny” the practice of “nuclear sharing” or the locations of the B61 free-fall gravity bombs in question. Expert analysts and observers agree that the United States currently deploys 150-to-180 of these nuclear weapons at bases in Germany, Italy, The Netherlands, Turkey and Belgium. The authors of the January 2018 report “Building a Safe, Secure, and Credible NATO Nuclear Posture” take for granted the open secret that nuclear sharing is ongoing even though all six countries are signatory parties to the Treaty on the Nonproliferation of Nuclear Weapons (NPT). A lot of discussion on CNN concerning this New York Times article. (New York Times) WASHINGTON — There are few things that President Vladimir V. Putin of Russia desires more than the weakening of NATO, the military alliance among the United States, Europe and Canada that has deterred Soviet and Russian aggression for 70 years. Last year, President Trump suggested a move tantamount to destroying NATO: the withdrawal of the United States. Senior administration officials told The New York Times that several times over the course of 2018, Mr. Trump privately said he wanted to withdraw from the North Atlantic Treaty Organization. Current and former officials who support the alliance said they feared Mr. Trump could return to his threat as allied military spending continued to lag behind the goals the president had set. In the days around a tumultuous NATO summit meeting last summer, they said, Mr. Trump told his top national security officials that he did not see the point of the military alliance, which he presented as a drain on the United States. At the time, Mr. Trump’s national security team, including Jim Mattis, then the defense secretary, and John R. Bolton, the national security adviser, scrambled to keep American strategy on track without mention of a withdrawal that would drastically reduce Washington’s influence in Europe and could embolden Russia for decades. Europeans generally expect the U.S. to use military force to defend a NATO ally from a Russian attack, but they are less supportive of using their own armed forces under the same circumstances. (CNN) President Trump could have avoided this by genuinely collaborating with our NATO allies to jointly pressure Russia from the start. Several allies proposed options to address the violation and ensure Russian compliance in an effort to preserve the treaty, according to diplomats who spoke to Reuters on the condition of anonymity. Sorry to interrupt the Trump smear-fest, but North Macedonia has recently started the admission process to NATO, which will make it the alliance's 30th member. This might be of interest given the thread's title "The Future of NATO."